Home Letter of Credit Basics What is a Partial Shipment? Partial shipment is one of the key definitions in a letter of credit transaction. 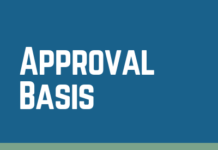 Every letter of credit that is requesting presentation of a transport document such as a bill of lading, air waybill, road consignment note, rail transport document etc. must indicate whether partial shipments are allowed or not allowed. On this post, I would like to explain partial shipments in letters of credit. You can find detailed explanations regarding the definition and conditions of the partial shipments. Definition: If a beneficiary under a letter of credit ships the credit amount in a single lot, corresponding to the whole credit amount, loaded with a single means of conveyance, then this can be defined as a complete shipment. If a partial shipment is effected under a letter of credit, then the drawing amount must match the shipped goods. Partial shipment must correspond to the partial drawing. Let us assume that a beneficiary makes two partial shipments under a commercial letter of credit. 1st shipment is for the amount of 200.000 USD and 2nd shipment is for the amount of 300.000 USD. The beneficiary demands 200.000 USD from the issuing bank for the 1st shipment and 300.000 USD for the 2nd shipment. This mechanism is called partial drawings. Both drawings are independent from each other. For example, 1st drawing may be clean without any discrepancies, but 2nd drawing may be rejected based on a discrepant presentation. What are the Conditions of a Partial Shipment? In certain situations it would be a very tricky job determining whether a partial shipment has been effected or not. Things are getting complicated especially if more than one set of transport documents have been presented under the same presentation. It is comparatively straight forward determination of the partial shipment if only one set of original transport documents have been presented and they are evidencing shipment on one means of conveyance within the same mode of transport. Checking the shipment quantity and drawings would be enough. If the letter of credit amount has not been drawn in full and documents are showing that the goods have not been loaded completely, you can reach to the conclusion that partial shipment has been effected. Important Note: Please kindly keep in mind that the letter of credit rules allow some tolerances even when partial shipments are prohibited. How to determine partial shipment when presentation consisting of one set of transport documents? Field 45A: Description of Goods and or Services: Frozen Seabass and Seabream. Frozen Seabass Price: 6 USD/KGS Frozen Seabream Price: 7USD/KGS Quantity: 5000 KGS seabass and 5000 KGS seabream 10.000 KGS in total. Delivery Terms: CIF Rotterdam Seaport Netherlands Incoterms 2010. 3 original signed commercial invoices and 3 copies. Full set of original bill of lading shipped on board established to the order of Bank Nederlandse Gemeenten notify applicant company marked freight prepaid. 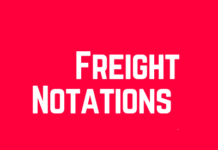 If more than one sets of original transport documents have been presented under the same letter of credit presentation, you can not determine whether partial shipment has been effected by simply comparing the actual shipment quantity and amount with the letter of credit quantity and amount. You have to check couple of additional variables in order to reach the correct conclusion. Step 1 : Checking the total quantity and amount shipped: If total quantity and amount less than what letter of credit states you can say that partial shipment has been effected. If actual shipment amount and quality equals to the letter of credit requirements, then you further need to check the transport documents. Step 2 : Checking the transport documents: If the transport documents evidencing shipment commencing on the same means of conveyance and for the same journey, provided they indicate the same destination, will not be regarded as covering a partial shipment, even if they indicate different dates of shipment or different ports of loading, places of taking in charge or dispatch. 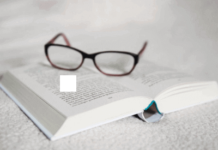 If the transport documents evidencing shipment on more than one means of conveyance within the same mode of transport, this will be regarded as covering a partial shipment, even if the means of conveyance leaves on the same day for the same destination. Field 45A: Description of Goods and or Services: Frozen Sliced Red Peppers and Frozen Sliced Potatoes. Frozen Sliced Red Peppers Price: 2 USD/KGS Frozen Sliced Potatoes Price: 1,5 USD/kgs Quantity: 10000 kgs peppers and 10000 kgs potatoes 20.000 KGS in total. Delivery Terms: CIF Dammam Seaport Kingdom of Saudi Arabia Incoterms 2010. Insurance certificate or policy in assignable form and endorsed in blank for 110% CIF commercial invoice value covering all risks showing claims payable in Kingdom of Saudi Arabia in commercial invoice currency. 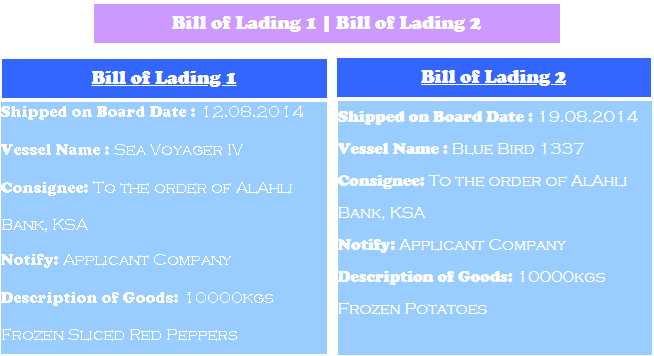 Full set of original bill of lading shipped on board established to the order of AlAhli Bank notify applicant company marked freight prepaid. 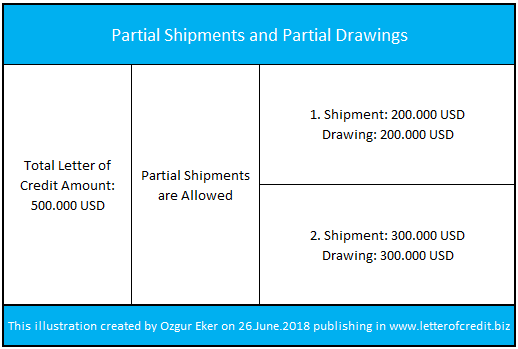 Conclusion of the Example 2: Letter of credit amount shipped in full. 10000 kgs frozen sliced red peppers and 10000 KGS frozen sliced potatoes have been loaded which makes 20.000kgs in total as the same as letter of credit requested, but presentation consisting of more than one set of bills of lading, which means that we have to look at the bills of lading in order to determine whether partial shipment effected or not. 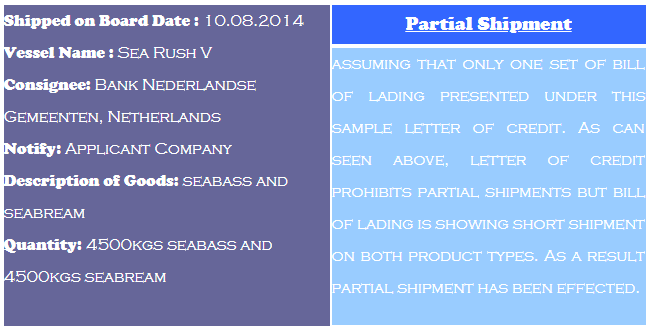 First bill of lading shows the vessel name “Sea Voyager” voyage number “IV”. Second bill of lading shows the vessel name ” Blue Bird” voyage number “1337 “. There are two means of conveyances (two different vessels) have been utilized on this shipment, as a result partial shipment has been effected. 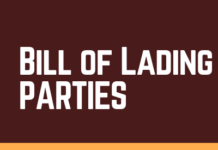 Previous articleWhat Does Full Set of Bills of Lading Mean?